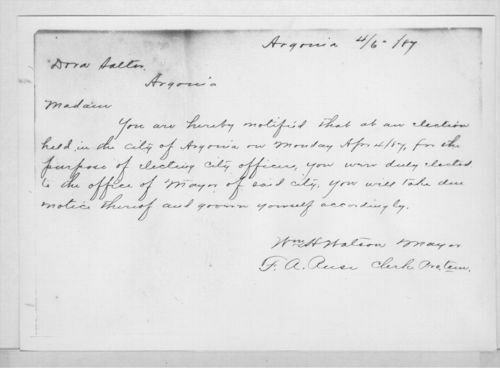 Soon after Kansas women gained the right to vote in municipal elections, voters elected a woman as mayor of Argonia. 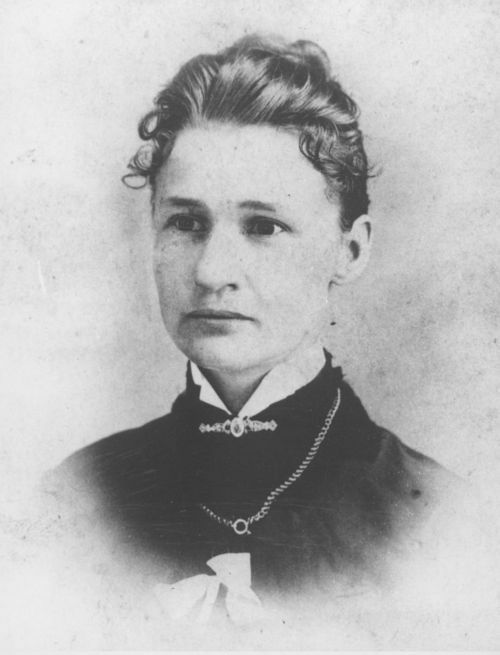 Susanna Madora Salter was elected the first woman mayor in the United States. Born March 2, 1860, in Belmont County, Ohio, Susanna Madora Kinsey moved to a Kansas farm with her parents in 1872. Eight years later, while attending the Kansas State Agricultural College, she met and married Lewis Salter. The couple soon moved to Argonia where she cared for their young children and became an officer in the local Woman’s Christian Temperance Union. Nominated on the Prohibition Party ticket by several Argonia men as a joke, Salter surprised the group and received two-thirds of the votes. She was elected in April 4, 1887, just weeks after Kansas women had gained the right to vote in city elections. The 27-year-old woman knew more about politics than her detractors realized. She was the daughter of the town’s first mayor. Her father-in-law, Melville J. Salter, was a former Kansas lieutenant governor. Although she apparently performed her job well, Salter never sought another elected office. Within a few years, the Salters moved to Oklahoma where the nation’s first woman mayor died in 1961 at the age of 101. Welcome to the Fantasy of Arms. Guns do not provide protection in reality. It’s all fantasy. Show me one person who actually succeeded in protecting themselves or someone else and Ill show you thousands who have died from gun violence and friendly fire. This notion that we have a right to protect ourselves with a gun is inspired by those who haven’t the faintest idea of what it’s like to shoot a gun whether under stress, with chaos ensuing and is ignorant about what really happens when you point one. The police carry guns. They are confronted with bad guys with guns all the time. They are well trained in tactical warfare. They are trained to stand in the line of fire and to talk down a nut with a gun. You really think the average person will succeed against someone who will kill you? The responsible people, who know the power and repercussions of pulling a gun on another person, want stricter laws. They are aren’t bitching and complaining about their rights, which are intact, they are doing their best to keep the rest of our rights intact. Like the freedom to go to a concert without becoming a carnival target. There has to be a beginning to end 8000+ gun related homicides and the thousands more that are friendly fire including children killing themselves. If you entertain the idea that the government will take away gun rights… that’s another fantasy the NRA and gun lobbyists want you to believe this so you yell about your rights. I, my children, my friends, my family should have the right to go out to parties, concerts, school, walk down the street without some gun toting malevolent insane gun activist shooting his glory into the crowd. When our founding fathers created this law… the guns they spoke about, took 30 seconds to load and then fire. I wonder how many people would be alive from all mass shootings if the law kept to that type of gun? Cause let me tell you. If you are defending yourself, and you miss on the first shot with any gun… you are DEAD.